The artist reciting a monologue. Giuliano photos. 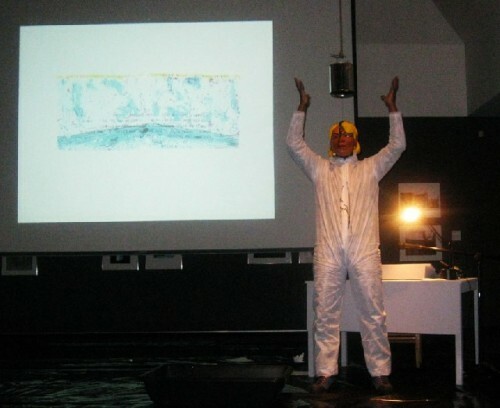 At the conclusion of the performance the artist stood under a dripping paint can. 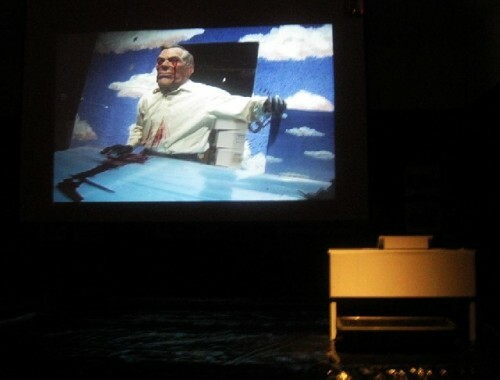 The video projected an image of a giant looming over the model of a sinking ship. We were advised to come early during the 6 to 9 PM vernissage for the 7 PM performance by William Pope.L a participant in the 2010 DeCordova Biennial. There were blinding snow squalls and rush hour traffic as we made our way from a nearby hotel in Waltham. The performance by the internationally renowned Pope.L was touted in the museum's pr handout as "An event not to be missed." We were on line at 6:30 PM while other guests took advantage of the sumptuous buffet. I managed a cracker or two and a bit of dip. The sign on the door said that we would be admitted at 6:45 PM. That changed to 7 and then even later as "technical difficulties" ensued. We saw the artist exit the space which was not a good sign. When the doors finally opened there was a rush but we managed to find seats in the front row. We hunkered down and waited through more adjustments. The gallery was packed. .
For the DeCordova, with its mandate for exhibiting the contemporary art of New England, this was a major coup. The artist fits the regional guidelines for the museum's first biennial. The change to a biennial format has been initiated by the new director Dennis Kois. Since 1990, Pope.L who describes himself as the "Friendliest black artist in America," has been living in Lewiston, Maine. He is a Lecturer of Theatre and Rhetoric at Bates College. When not teaching he is known for "crawls." A piece "The Great White Way" was a crawl of some 22 miles and took five years to complete. For the work he wore a Superman costume with a skateboard on his back. It entailed slithering along the entire length of Broadway in New York City. 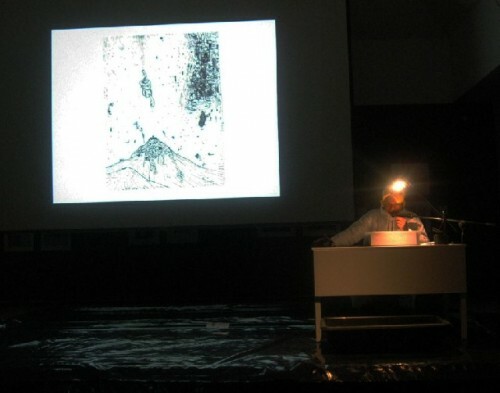 Documentation of this performance was included in the 2002 Whitney Biennial. The space for the current piece was set up on the raised end of the large original gallery in the museum. There are steps leading up to the area located in an apse like shape with the museum's towers on either side. The floor was covered with black plastic tarps. On the "stage" there was a simple desk and chair with a large black trough in front of it. Above the desk was suspended a gallon sized paint can hanging from a rope. Behind the desk was a screen and in front of the stairs an assistant sat next to a laptop wired to a video projector. Eventually, a woman made remarks about the artist with excerpts from his resume. We were informed that the artist wanted to start the event by showing us one of his videos. The opening shot revealed a ship apparently sinking. It was a hand crafted model in a painted setting. The scale of the object was not initially apparent. But then the shot widened to include wings and a part of a standing figure. As the video evolved we were shown more and more of the setting. Eventually, the shot panned back far enough to feature the set with a crew of camera men and participants including the artist directing the action. The shot panned back even further eventually documenting the loft like setting. The notion was to convey the idea of the theatrical and then cut back to ersatz reality. It was a trope familiar from Pirandello's iconic "Six Characters in Search of an Author" or, before that, Shakespeare's play within a play in "Hamlet." This underscored what appeared to be a dominant theme in the performance and video that preceded it. It signified a sophisticated lineage to the conceptual content. The notion of art within art for example. On the other hand, the artist employed a funky primitivism and savant manner of conveying these ideas as primal and low tech. Depending upon your mood, inclination, or vantage point the work is either informed, philosophical, and theoretical or cloyingly dumb and amateurish. Of course, that is a familiar avant-garde dilemma. One was presented with the options of buying into the premise of the work as scintillatingly galvanic and positively brilliant, or just an annoying waste of time. There was an interesting other factor as we endured/ enjoyed the performance after such a long technical delay. We were taunted by the ambient sound of a raging good time and raucous vernissage occurring just outside the gallery. The disaster of the ersatz sinking ship conflated with the eventual presence of a masked "monster," or so it seemed, because of the juxtaposition of scale. The character stared out at us. At one point the shot of the giant's head consumed the entire screen. In a development that recalled just about any episode of "House" the character started to bleed profusely. Rivers of blood poured out of his eyes. As the scene developed we followed the current of blood flooding the set and loft studio.The shot panned back to reveal an assistant pouring "blood" into the pump that fed the two tubes connected to the inside of the mask. Again, in a primitivist/ outsider manner, the artist demonstrated the process of the illusion. The numbing aesthetic question is why he fixated on the contrast between illusion and reality? Just what we are meant to think and feel when he pulls back the curtain? Why does the magician/ artist reveal his tricks? When the video eventually ended, some would say mercifully, the artist appeared on stage. "He" was apparently "She." This was signified by yet another, rubber, Halloween mask of a blonde girl. The character related to the similar "Giant" with bleeding eyes in the video. Because of our proximity to the stage, protected by tarps, there was some apprehension that we would become subsumed in an aqueous event. Rather like when we got splashed with honey as a naked Karen Finley rolled about on the floor. Performance art has a way of drawing you in. Literally. In addition to the rubber mask covering his head the artist wore a white jump suit. Initially he/ she looked about in quirky, jerky movements; including gazing in wonder at that suspended paint can. Eventually, the artist sat at the desk in the darkened space facing us. There was a desk lamp illuminating a low podium with papers. Pulling over and adjusting a microphone he read through a droning litany of self reflective, artsy conundrums. They were primarily concerned with the revolving projection of "failed drawings." They were looped through several times. Of themselves the drawings were of some interest but that dulled with repetition. The character conveyed frustration and impatience. Occasionally, a piece of paper in the "script" was crumpled and tossed aside. Now and then the character dabbed at the "sweat" accumulating on its "face/mask." The aspect of muffled reading by a damaged persona too vividly recalled the character in Beckett's one man play "Krapp's Last Tape." Harold Pinter performed the role just months before his death. This reference to Beckett, which overwhelmed me as I sat through Pope.L's performance, begs the question of the relationship between performance art and theatre. Why are we willing to cut an artist more slack than an actor? Too often performance art is just bad theatre. Of course, audiences and critics hated those initial Becket performances. Perhaps artists can get away with such "borrowing" because, well, a gallery or museum is not a theatre. The dialogue referenced the projected images as failed rockets which did not reach space. They crashed and burrowed into the earth creating worm like forms. There was muddled discussion about why the drawings were failures and their possible sexual references. The mumbled dialogue was hard to follow. It was delivered in a whispered, distorted, mufflled manner. It became an individual decision to pay attention, or not, to what was muttered. There was a trade off between the naÃ¯f crudeness and inept manner of the persona. Nuggets of informed art speak and telling reflections on a gamut of issues occasionally jolted us back to attention. The boy/girl discussed race and gender as well as the complex workings of the art world. The persona, though crude, conveyed considerable education. The dialogue also reflected on the need for a mask and hiding the artist's identity. It conveyed a desire for distance from the appearances of the every day. It subverted blackness into blondness. The character reversed both gender and race. An assistant untied the rope attached to the paint can which was then lowered. The knot was retied ineptly. It was annoyingly evident that the assistant was never a Boy Scout or a sailor. This was compounded when, at a later point, he returned to untie and lower the can then refasten it. The clumsiness conveyed lack of skill and was not part of the act. It was just incompetence. This evoked similar feelings about the performance itself. As is often the case with the avant-garde real time dragged on. The sound of the party outside was ever more enticing. We longed for closure. In the video the giant, masked character related an incident which was perhaps the real life experience of Pope.L. He described a non stop nose bleed that resulted in two days of intensive care and blood transfusions. The bleeding eyes in the video were a metaphor reflecting his real life experience. The artist stood up and awkwardly stumbled around the desk. Standing under the adjusted paint can it oozed a thick red substance. It dripped down over the artist for several minutes as we watched attentively. After which the artist exited the stage. "Good grief! This is art that only a devote advocate of the arts could sit through and respectfully comment on. My hat's off to you Charles. You do hard work and you do it well."